Two local Pacific Beach breweries, Karl Strauss Brewing Company and Amplified Ale Works, have teamed up to brew something special for their neighborhood. The team of brewers just released the second installment of Pathway Ale, an on-going collaboration series to help raise funding for local community project, PB Pathways. The PB Pathways project is organized by “beautifulPB” a public non-profit charity focused on creating a sustainable and more beautiful Pacific Beach. The goal of the project is to build a network of safe neighborhood routes encouraging people to walk, bike, or skate to their destinations; ultimately making PB a safer and friendlier place for pedestrians, bicyclists, and skaters. While brainstorming ways to raise funding for the project, Alex Pierson, co-owner of Amplified Ale Works and current board member of beautifulPB, discussed the idea of brewing a beer. “We realized this could provide both needed funds and also create greater awareness of beautifulPB's efforts in the community, and the PB Pathways specifically, by taking the story into the bars and restaurants locals frequent the most,” says Pierson. Amplified Ale Works turned to their friends and neighbors at Karl Strauss Brewing Company, who operate their main production brewery in PB and has a long history of supporting the local community, to suggest a collaborative effort between the two breweries. They jumped on board with the idea and the team decided to turn the project into an ongoing series with rotating beer styles that change throughout the seasons to keep the community looking forward to each new, fresh creation. "We want to brew a variety of beer styles that are fun to make, appeal to PB beer drinkers, and ultimately raise money for this awesome project," said Karl Strauss Brewmaster Paul Segura. "The current batch of this Pathway Ale (Red IPA) has been wildly popular. We sold through the first brew within days and we have bars anxiously waiting for more. We are flattered and humbled and we look forward to sharing another brew with the fine folks of PB." To learn more about beautifulPB and the PB Pathways Project visit beautifulpb.com. 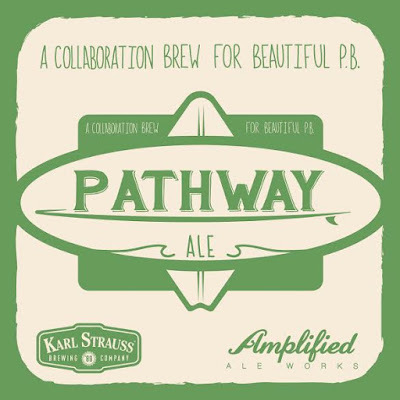 To learn more about the current installment of Pathway Ale, visit karlstrauss.com/beer.